A truly unique experience on Mt Buffalo. 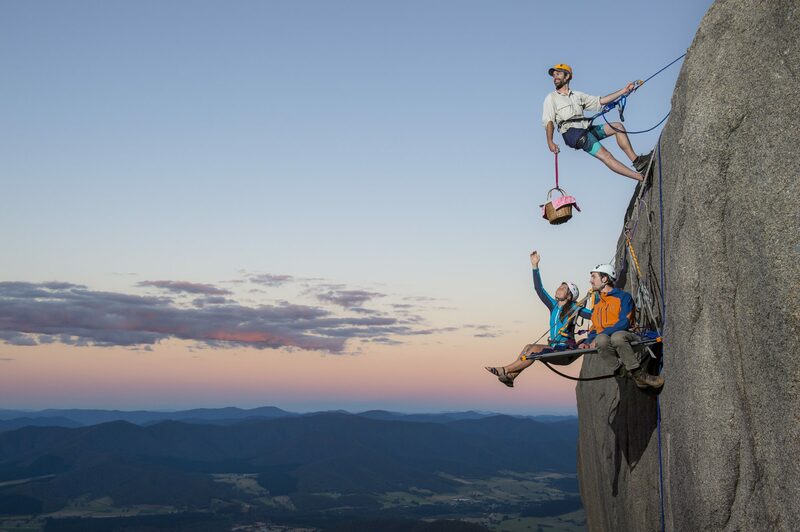 Come dine with us on your private ledge suspended 300m above the valley floor. Enjoy local produce lovingly prepared whilst reveling in the majestic views from Mt Buffalo. We offer sunrise, lunch or dinner cliff picnic options available throughout the year and have two ledges available for groups of four. The 'standard' Cliff Picnic includes a warm-up abseil session to get you comfortable, before you zip down onto your ledge, relax, and enjoy a delicious hamper. Far from a standard experience! Have a special occasion in mind? The cliff picnic is perfect for marriage proposals, birthday and Christmas presents and much more. Our guides will create the perfect experience for you and make sure all your needs are taken care of. Contact Bright Adventure Company to chat about what you have in mind and we can tailor an experience just for you.